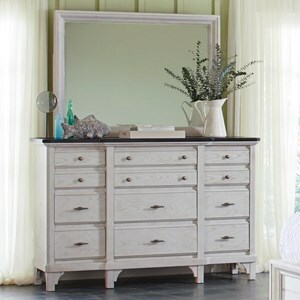 With eight spacious drawers and a large serpentine shaped mirror you can create a master suite that is both functional and stylish. 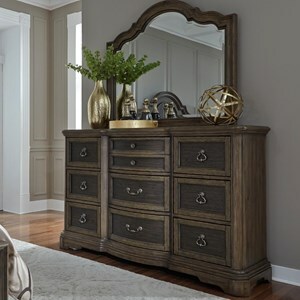 Expertly crafted from solid pine and acacia veneers this piece features heavy stacked mouldings, framed drawer faces and antique copper finished hardware. The large mirror will create an opening effect while brighten your room by enhancing the natural light. 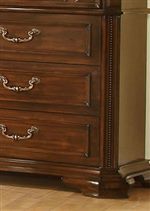 Store all of your sweaters, jeans and more in the lower six drawers and your valuables in the two felt lined top drawers. Complete an elegant room you will love spending time in with this lovely combination. 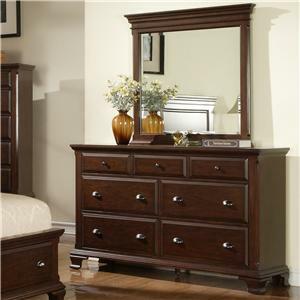 The B00310 Traditional 8 Drawer Dresser and Mirror by Avalon Furniture at Van Hill Furniture in the Grand Rapids, Holland, Zeeland area. Product availability may vary. Contact us for the most current availability on this product. 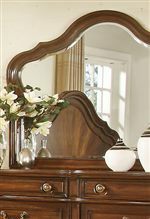 Case Detail Serpentine shaped cases, sunburst design matched veneers and beaded mouldings. 45° canted beaded pilasters on case pieces. Drawer / Shelf Construction Plywood drawers with English/English Construction and Stained interiors. Select Top Drawers are Felt Lined. 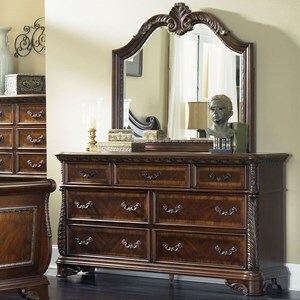 Create a room that is both inviting and elegant with this traditional bedroom collection for your master suite. 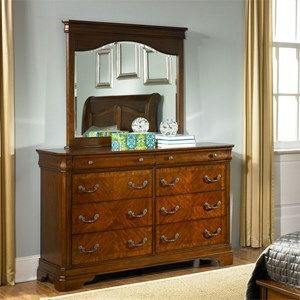 Pine solids are accompanied by acacia veneers with a sunburst match design in a medium brown finish. Each storage piece has ample room for all of your clothes and valuables stored neatly away with felt lined top drawers for valuables. 45° Canted pilasters, beaded mouldings and serpentine shaped silhouettes complete the classic look of this collection. 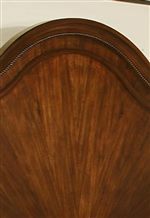 The B00310 collection is a great option if you are looking for Traditional furniture in the Grand Rapids, Holland, Zeeland area. 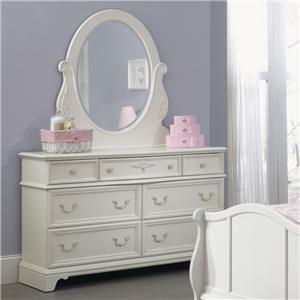 Browse other items in the B00310 collection from Van Hill Furniture in the Grand Rapids, Holland, Zeeland area.